Within education nowadays there is a clear trend towards doing research in education and carrying out practice-based enquiries within schools as professional development and as part of degree courses. The paradox is, though, that many new and experienced teachers and students are asked to get involved in such researches, but at the same time there is the sentiment that such researches are not of huge value or not successful. This is the consequence of lack of training and guidance regarding carrying out research and practice-based enquiries. 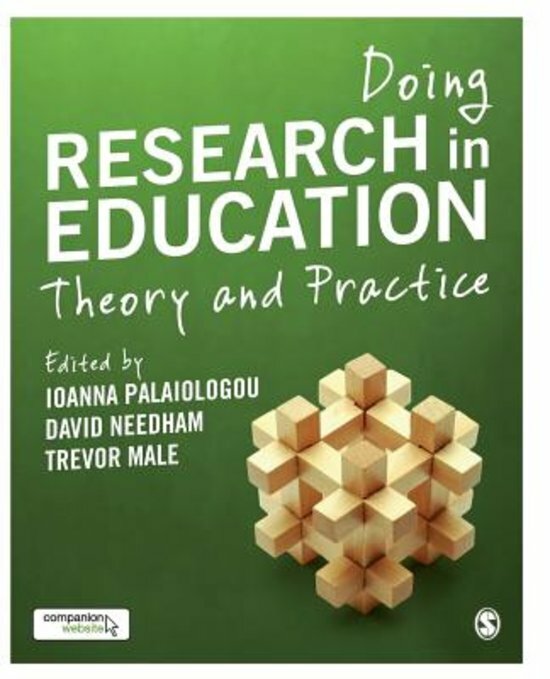 There are many research methodology and methods guidebooks available, but the editors Ioanna Palaiologou, David Needham and Trevor Male have succeeded in ways where other authors and editors fail: the book is slim and easy to read, which makes it an accessible and concise introduction into research. The book is divided into twelve chapters, whereby each section deals with a different aspect related to educational research. The topics covered include the value, benefit and purpose of research, an introduction to methodology and methods, thoughts on ethical issues and collecting and analysing qualitative and quantitative data, and guidance on writing and reporting research findings. The individual chapters are also structured into several sections, so that the reader is reminded of key messages, but also pointed towards further readings, websites and resources. Practical tips and activities related to doing research mean that the book can also be used as a workbook and a resource for planning research. Due to its structure and the accessible style of writing, the book really is a great introduction to research, and as such should be part of any library in order to support teachers and post-graduate students with their first steps into practice-based enquiries. Obviously, due to the fact that the contents are quite condensed, this book cannot and should not be the only resource when planning research. It is a great introduction, but further reading and training will be required in order for the research process to be beneficial and successful. However, many teachers avoid carrying out researches because they feel they do not know enough, and this is where this publication could be a great resource within schools, in particular. At the end of each chapter there are references and links that will provide some more guidance, and once a teacher has gained confidence, then they may well want to tackle some of the more detailed research methodology and methods books. With the basic knowledge gained from “Doing research in education” any other research methodology or methods will seem less daunting and difficult to access. I am very much in favour of teachers doing research to improve their practice and to keep learning within their own classrooms, and for that I believe training and courses are necessary. However, if for reasons such as lack of funds or lack of time, teachers cannot access training, then books like this one are a great starting point. The aspects covered in this guidebook are excellently explained and link to further reading for deeper engagement and understanding. The only issue I would raise is the lack of practical advice where reflexivity and reflective journaling are concerned. The importance of reflections is highlighted, but there is no real guidance on how to keep an effective journal and how to make good use of journaling. Many find this aspect difficult within their teaching practice, so would require more guidance and training on that. Overall, though, this is a fabulous resource and I strongly recommend having it in your library.